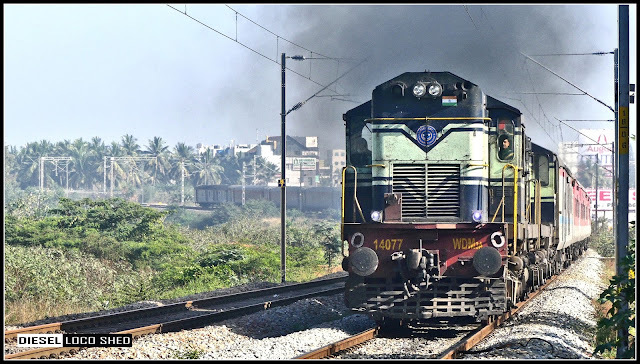 The Nizamuddin KSR Bengaluru Rajdhani Supefast Express (22692) gets powered by Alco twins from Krishnarajapuram replacing the customary WDP 4D from Krishnarajapuram !! One of the prestigious trains of the South Western Railways, the SBC Rajdhani Express is regularly powered by WDP 4D Locomotive from Diesel Loco Shed, Krishnarajapuram (KJM), between KSR Bengaluru & Secunderabad and further is hauled by a WAP 7 Locomotive from Electric Loco Shed, Lallaguda (LGD)to its Destination. Watch a very rare Event where in the SBC Rajdhani Express is powered by the Classic ALCO twins, gracefully on its last leg of the journey !! 22692 / Rajdhani Express led by WDM 3A Multiple Unit !! Watch the Video of the Same here ! !